I’m closing off this holiday gift guide series with ‘Christmas Gifts for Her’. 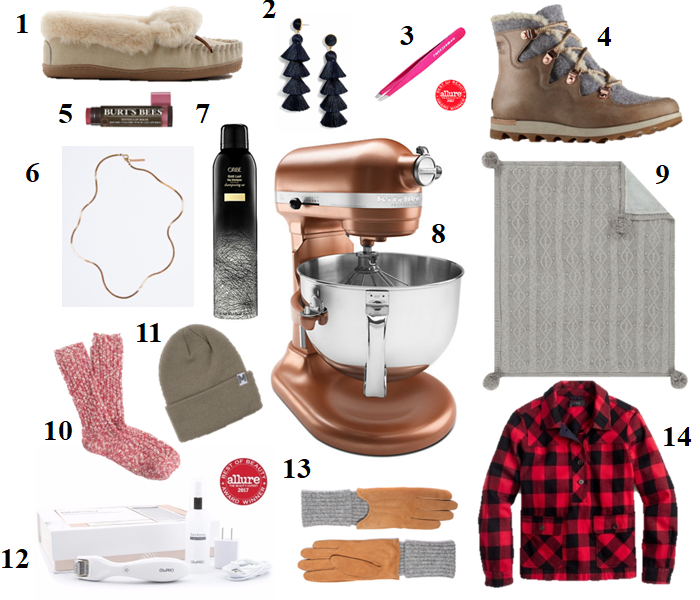 This one might be my favourite gift guide yet. It’s a roundup of items I own, items on my wish list, and items I am gifting that are popular this season and bound to make a lasting impression. Whether you’re shopping for your wife, girlfriend, sister, mother, or friend there are a whole lot of products to choose from if your budget is big or small. J.Crew Women’s Lodge Moccasins – ON SALE! These slippers are actually so warm and cozy and provide great support when you’re on your feet in the house. You could even try a similar pair by Ugg here. Baublebar Gabriela Tassel Fringe Earrings (navy) – The tassel fringe earrings are so fun and flirty; they also come in a range of colours. Tweezerman Pink Perfection Slant Tweezer – The best tweezers out there that operate with great precision. You can also grab them from Sephora. Women’s Sneakchic Alpine Holiday Boot – ON SALE! These sleek boots are definitely on my Boxing Week shopping list. That rose gold hardware is perfection. The fit is narrow and runs on the small side so SIZE UP! Burt’s Bees Tinted Lip Balm – With our dry, cold weather it’s nice to wear a reliable and hydrating lip balm every day that also offers a hint of colour. Stocking stuffer idea!!! CoutuKitsch Solo Flat Curb Chain (18″) – I love a simple gold chain because you can do SO much with it. You can layer it with other necklaces or wear it solo for a more classic look with a blouse, dress, or top. I love this designer because she is local (YYC) and makes such beautiful pieces, it’s hard to choose. I also love these stacking rings and earrings. You can shop her pieces online or at The Livery Shop in Inglewood. ORIBE Dry Shampoo – Ok, so I’ve been hunting around for a more natural dry shampoo the last couple months and this is it!!! If you’re in Calgary you can grab it from any of the Hedkandi Salon locations or you can find it at Holt Renfrew or from Amazon. It’s worth every penny. Kitchen Aid Pro 600TM 6 Qt Bowl-Lift Stand Mixer (copper pearl) – ON SALE! This product is not only totally functional and easy to use but it’s gorgeous on the kitchen counter. I love the bowl-lift feature and it can handle up to 14 cups of flour!!! Great for the gourmet chef. Pottery Barn Cozy Fur Reversible Pom Pom Throw (grey) – ON SALE! I’m obsessed with PB blankets and this one is so warm and cozy – perfect for winter! The pom-pom’s are really feminine and popular right now. J.Crew Camp Socks – ON SALE! These socks are the best! I wear them around the house or out and about with boots. They are tight and fitted enough that they don’t slouch and get sloppy. My Mila Tan Knit Toque – I have this hat and wear it on repeat because of the neutral tan colour!! It’s also a nice snug fit for a thick cozy toque. You can shop her items online or locally at these retailers just in time for Christmas. GloPRO Microneedling Regeneration Tool – This is the item I asked Santa for! It’s currenty sitting under my tree wrapped. I cannot wait to try it out after all the amazing reviews and videos I’ve seen. Voted as Best of Beauty by Allure for 2017, this anti-aging tool will work wonders by lessening wrinkles, scars, and stretch marks by producing new collagen. You can also grab it from Nordstrom. Soia & Kyo INDIANA Suede Gloves with Ribbed Sleeve – This style glove is totally unique and the two colours really add interest. I love the long rib sleeve for added warmth too. You could even try it in the smoke colour from Altitude Sports. J.Crew Shirt-Jacket (buffalo check) – This is a great cozy shirt-jacket that I would totally pair with a classic turtleneck or collared shirt to make it a bit more dressy. Perfect staple to own for the winter! When you’re last minute shopping at Christmas time I always call the store in advance to make sure they have the item I want and see if they’ll put it on hold for me. A lot of stores are doing curbside pick up now too so try that to help speed up the process! I.e. Nordstrom, Best Buy, etc. And remember, if you see something you like comment below and forward it off to your husband or the one that will be spoiling you this year.